Facing Newfoundland Circus, Vastint Hospitality propose to construct a stepped seven-storey, 214-bedroom hotel from modular units. The site is cleared of the former buildings. The Society welcomes the redevelopment of this site and the change of use to an hotel, which could enhance the district, create employment, and generate economic returns. The Society regrets that it cannot support the proposed standardised industrial design. The Society was disappointed to write a negative response; we support development and good modern design. Pre-fabricated construction can bring economic and environmental performance benefits but there is no reason why off-site construction should result in a monolithic form. The design falls short of the standards that local planning policy requires. Development in the city centre must deliver high quality urban design that contributes positively to an area’s character and identity while not preventing or discouraging innovation. The Council has an aspiration to redevelop of the frontage to Newfoundland Street that would conceal the multi-storey car parks. This important site merits a building of high architectural quality. 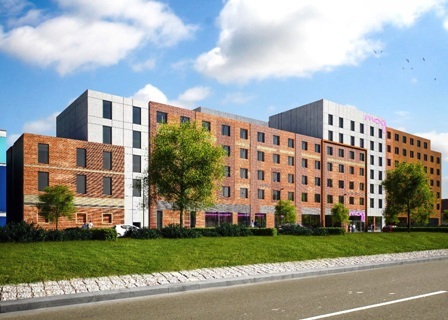 The mechanical design of the hotel would cause material harm to the Council’s ambition to transform the city gateway. The Society has said that the building is an accumulation of poorly articulated cubes with monotonous, standardised windows that lack finesse. There are no architectural features to create any hierarchy of floors or to mark the top of the building. None of the blocks have vertical features to create articulation. All facades look bland and the roof line does not enhance the townscape. Bristol Civic Society’s full response [PDF, 183KB] Right-click to download, click to view. Where does one start in condemnation of this scheme? The Poxy Hotel would be a better name. I believe that another revised plan is in. I’m also afraid to say it’s just as horrid as all the others. This time, with an orange lego style ‘feature wall’. I remember Jerry Hicks , probably 20 years ago, condemning the proliferation of the square window openings ( perhaps occasionally relieved by rectangular ones). This was the new boredom in design .